Back in 2013, I did an assessment of economic policy changes that occurred during the Clinton Administration. The bottom line was that the overall burden of government declined by a semi-significant amount. Which presumably helps to explain why the economy enjoyed good growth and job creation in the 1990s, especially in the last half of the decade when most of the pro-growth reforms were enacted. The chart I prepared has been very helpful when speaking to audiences about what actually happened during the Clinton years, so I decided to do the same thing for other presidents. A week ago, I put together my summary of economic policy changes during the Nixon years. At the risk of understatement, it was a very grim era for free markets. A few days ago, I followed up with a look at overall economic policy during the Reagan years. That was a much better era, at least for those of us who favor economic liberty over statism. Now it’s time to look at the record of George W. Bush. It’s not a pretty picture. I think the TARP bailout was the low point of the Bush years, though he also deserves criticism for big spending hikes (especially the rapid rise of domestic spending), additional red tape, special-interest trade taxes, and more centralization of education. On the plus side, there was a good tax cut in 2003 (the 2001 version was mostly Keynesian and thus didn’t help growth), as well as some targeted trade liberalization. Unfortunately, those good reforms were swamped by bad policy. As has been the case for other presidents, my calculations are based solely on policy changes. Presidents don’t get credit or blame for policies they endorsed or opposed. 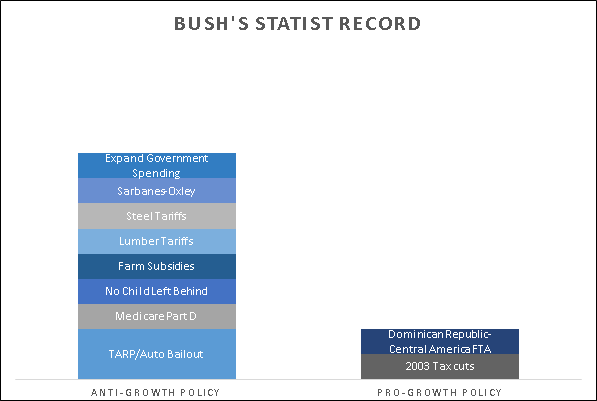 So when fans of President Bush tell me he was better on policy than his record indicates, I shrug my shoulders (just like I don’t particularly care when Republicans on Capitol Hill tell me that Clinton’s good record was because of the post-1994 GOP Congress). I simply want to show where policy improved and where it deteriorated when various presidents were in office. Other people can argue about the degree to which those presidents deserve credit or blame. In the case of Bush, for what it’s worth, I think he does deserve blame. None of the bad laws I listed were enacted over his veto. Incidentally, I was torn by how to handle monetary policy. The artificially low interest rates of the mid-2000s contributed to the housing bubble and subsequent financial meltdown. Should I have blamed Bush for that because of his Federal Reserve appointments? On a related note, the affordable lending mandates of Fannie Mae and Freddie Mac were made more onerous during the Bush years, thus exacerbating perverse incentives in the financial sector to make unwise loans. Was that Bush’s fault, or were those regulations unavoidable because of legislation that was enacted before Bush became President? Ultimately, I decided to omit any reference to the Fed, as well as Fannie and Freddie. But I double-weighted TARP, both because it was awful economic policy and because that was a way of partially dinging Bush for his acquiescence to bad monetary and housing policy. If there’s a lesson to learn from this analysis of Bush policy, it is that party labels don’t necessarily have any meaning. The economy suffers just as much if a Republican expands the burden of government as it does when the same thing happens under a Democrat. P.S. I haven’t decided whether to replicate this exercise for pre-World War II presidents. If I do, Calvin Coolidge and Grover Cleveland presumably would look very good. When debating and discussing the 2008 financial crisis, there are two big questions. And the answers to these questions are important because the wrong “narrative” could lead to decades of bad policy (much as a mistaken narrative about the Great Depression enabled bad policy in subsequent decades). What caused the crisis to occur? What should policy makers have done? In a new video for Prager University, Nicole Gelinas of the Manhattan Institute succinctly and effectively provides very valuable information to help answer these questions. Particularly if you want to understand how the government promoted bad behavior by banks and created the conditions for a crisis. Here are some further thoughts on the issues raised in the video. But that’s only part of the story. It’s also important to recognize that easy-money policies last decade created too much liquidity and that corrupt subsidies and preferences for Fannie Mae and Freddie Mac steered much of that excess liquidity into the housing sector. These policies helped to create the bubble, and many financial institutions became insolvent when that bubble burst. TARP wasn’t necessary to avert a meltdown – Because the video focused on how the “too big to fail” policy created bad incentives, there wasn’t much attention to the topic of what should have happened once big institutions became insolvent. Defenders of TARP argued that the bailout was necessary to “unfreeze” financial markets and prevent an economic meltdown. But here’s the key thing to understand. The purpose of TARP was to bail out big financial institutions, which also meant protecting big investors who bought bonds from those institutions. And while TARP did mitigate the panic, it also rewarded bad choices by those big players. As I’ve explained before, using the “FDIC-resolution” approach also would have averted the panic. In short, instead of bailing out shareholders and bondholders, it would have been better to bail out depositors and wind down the insolvent institutions. Bailouts encourage very bad behavior – There’s a saying that capitalism without bankruptcy is like religion without hell, which is simply a clever way of pointing out that you need both profit and loss in order for people in the economy to have the right set of incentives. Bailouts, however, screw up this incentive structure by allowing private profits while simultaneously socializing the losses. This creates what’s known as moral hazard. I’ve often used a simple analogy when speaking about government-created moral hazard. How would you respond if I asked you to “invest” by giving me some money for a gambling trip to Las Vegas, but I explained that I would keep the money from all winning bets, while financing all losing bets from your funds? Assuming your IQ is at least room temperature, you would say no. But our federal government, when dealing with the financial sector, has said yes. Good policy yields short-run pain but long-run gain – In my humble opinion, Nicole’s most valuable insight is when she explained the long-run negative consequences of the bailouts of Continental Illinois in 1984 and Long-Term Capital Management in 1998. There was less short-run pain (i.e., financial instability) because of these bailouts, but the avoidance of short-run pain meant much more long-run pain (i.e., the 2008 crisis). Indeed, this “short termism” is a pervasive problem in government. Politicians often argue that a good policy is unfeasible because it would cause dislocation to interest groups that have become addicted to subsidies. In some cases, they’re right about short-run costs. A flat tax, for instance, might cause temporary dislocation for some sectors such as housing and employer-provide health insurance. But the long-run gains would be far greater – assuming politicians can be convinced to look past the next election cycle. Let’s close by re-emphasizing a point I made at the beginning. Narratives matter. For decades, the left got away with the absurd statement that the Great Depression “proved” that capitalism was unstable and destructive. Fortunately, research in recent decades has helped more and more people realize that this is an upside-down interpretation. Instead, bad government policy caused the depression and then additional bad policy during the New Deal made the depression longer and deeper. Now we have something similar. Leftists very much want people to think that the financial crisis was a case of capitalism run amok. They’ve had some success with this false narrative. But the good news is that proponents of good policy immediately began explaining the destructive role of bad government policy. And if Nicole’s video is any indication, that effort to prevent a false narrative is continuing. P.S. The Dodd-Frank bill was a response to the financial crisis, but it almost certainly made matters worse. Here’s what Nicole wrote about that legislation. I periodically comment about government corruption, often in the context of trying to make the general point that shrinking the size and scope of the public sector is the most effective way of reducing sleaze in Washington. Now let’s get specific. I’ve already cited Obamacare, the tax code, and the Export-Import Bank as facilitators of corruption. Let’s augment that list by looking at government intervention in the financial sector. We’ll start with some findings on the effectiveness of lobbying. In some new research, two professors at George Mason University’s Mercatus Center found that being active in Washington is beneficial for top executives, but it doesn’t help a company’s bottom line. Here’s how the Washington Examiner summarized the study. What is the return on investment in lobbying? Does a PAC contribution actually pay for itself? There are so many cases of a lobbyist winning an earmark, or a PAC contribution immediately preceding a subsidy, that it’s hard not to see politics as a good investment. …But for every company that hits the jackpot after lobbying campaign, scores of others end up throwing away money on lobbyists — and scores of executives whose PAC contributions don’t help the company a bit. Business professors Russell Sobel and Rachel Graefe-Anderson of the Mercatus Center at George Mason University collected the data and dug into the bigger question: Do lobbying expenditures and PAC contributions increase corporate profits, on average? Their answer: No… When Sobel and Graefe-Anderson crunched numbers, conducted regressions, and controlled for firm size, industry and other factors, they arrived at data “suggesting that any benefits gained from corporate political activity are largely captured by firm executives.” In short, when a CEO and a lobbyist decide to get their company more involved in politics, the CEO and the lobbyist benefit, while not helping the company. These findings at first struck me as counterintuitive. After all, there are plenty of companies, such as General Electric and Archer Daniels Midland, that seem to obtain lots of unearned profits thanks to their lobbying activities. But don’t forget that government – at best – is a zero-sum game. So for every company, industry, or sector that “wins,” there will be lots of companies, industries, and sectors that suffer. And speaking of industries that benefit, there was one exception to the Mercatus Center findings. The only exception was the banking and financial sectors, where they found “positive and significant correlations between firm lobbying activity and three measures of firm financial performance,” including return on investment and return on equity. At this stage, let’s be careful to specify that lobbying is not necessarily bad. If a handful of business owners want to join forces to fight against higher taxes or more regulation, I’m all in favor of that kind of lobbying. They’re fighting to be left alone. But a big chunk of the lobbying in Washington is not about being left alone. It’s about seeking undeserved benefits by using the coercive power of government. And this latter definition is a good description of what the financial industry has been doing in Washington. That’s bad for taxpayers, but it’s also bad for the financial sector and the overall economy. Here are some of the conclusions from a recent study published by the New York Federal Reserve Bank. …there have been many concerns with banks deemed “too big to fail.” These concerns derive from the belief that the too-big-to-fail status gives large banks a competitive edge and incentives to take on additional risk. If investors believe the largest banks are too big to fail, they will be willing to offer them funding at a discount. Together with expectations of rescues, this discount gives the too-big-to-fail banks incentives to engage in riskier activities. …The debate around too-big-to-fail banks has given rise to a large literature. … we study whether banks that rating agencies classify as likely to receive government support increase their risk-taking. …The results of our investigation show that a greater likelihood of government support leads to a rise in bank risk-taking. Following an increase in government support, we see a larger volume of bank lending becoming impaired. Further, and in line with this finding, our results show that stronger government support translates into an increase in net charge-offs. Additionally, we find that the effect of government support on impaired loans is stronger for riskier banks than safer ones, as measured by their issuer default ratings. …the level of impaired loans in a bank loan portfolio increases directly with the level of government support. …riskier banks are more likely to take advantage of potential sovereign support. Isn’t that wonderful. Our tax dollars have been used to increase systemic risk and undermine economic growth. Though none of us should be surprised. Since this has been a depressing column, let’s enjoy some morbid TARP humor. Here’s a cartoon from Robert Ariail about the cronies who got rich from the Bush-Obama bailouts. Good to see Hank Paulson getting ripped. At the end of the Bush Administration, I attempted to convince the White House that “FDIC resolution” was a much better way of recapitalizing the banking system. I was repeatedly told, though, that Paulson was in charge and there was no way of stopping him from bailing out his former cronies on Wall Street. 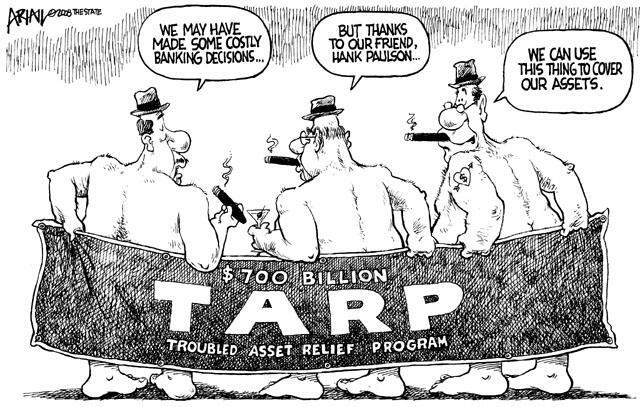 Here’s another cartoon about the real victims of TARP. Like the first cartoon, it’s an oldie but goodie and it’s a good illustration of how government is a zero-sum scam. But let me re-emphasize a point I made above. Taxpayers aren’t the only ones to lose. The entire economy suffers from bailouts and subsidies. Such policies distort the allocation of capital and lead to slower long-run growth. That may not be easy to measure, but it matters a lot. Here’s a video explaining how such policies create moral hazard. This is a good time to recycle the famous poster about supposed government solutions. P.S. Not all financial institutions are corrupted by government. The nation’s 10th-largest bank, BB&T, did not want and did not need a bailout. But as the bank’s former CEO (and, I’m proud to say, current Cato Institute president) explained in his book, thugs from Washington threatened to use regulatory coercion if BB&T didn’t participate. I got involved in a bit of a controversy last year about presidential profligacy. Some guy named Rex Nutting put together some data on government spending and claimed that Barack Obama was the most frugal President in recent history. I pointed out that Mr. Nutting’s data left something to be desired because he didn’t adjust the numbers for inflation. Moreover, most analysts also would remove interest spending from the calculations since Presidents presumably shouldn’t be held responsible for servicing the debt incurred by their predecessors. But even when you make these adjustments and measure inflation-adjusted “primary spending,” it turns out that Nutting’s main assertion was correct. Obama is the most frugal President in modern times. When you look at the adjusted numbers, though, Reagan does a lot better, ranking a close second to Obama. I also included Carter, Nixon, and LBJ in my calculations, though it’s worth noting that none of them got a good score. Indeed, President Johnson even scored below President George W. Bush. Some of you may be thinking that I made a mistake. What about the pork-filled stimulus? And all the new spending in Obamacare? Most of the Obamacare spending doesn’t begin until 2014, so that wasn’t a big factor. And I did include the faux stimulus. Indeed, I even adjusted the FY2009 and FY2010 numbers so that all of stimulus spending that took place in Bush’s last fiscal year was credited to Obama. So does this mean Obama is a closet conservative, as my misguided buddy Bruce Bartlett has asserted? Not exactly. Five days after my first post, I did some more calculations and explained that Obama was the undeserved beneficiary of the quirky way that bailouts and related items are measured in the budget. 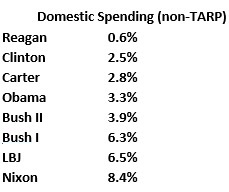 It turns out that Obama supposed frugality is largely the result of how TARP is measured in the federal budget. To put it simply, TARP pushed spending up in Bush’s final fiscal year (FY2009, which began October 1, 2008) and then repayments from the banks (which count as “negative spending”) artificially reduced spending in subsequent years. 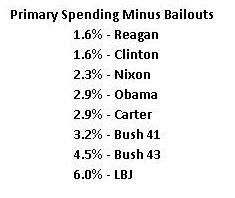 And when I removed TARP and other bailouts from the equation, Obama plummeted in the rankings. Instead of first place, he was second-to-last, beating only LBJ. But this isn’t the end of the story. My analysis last year only looked at the first three years of Obama’s tenure. We now have the numbers for his fourth year. And if you crank through the numbers (all methodology available upon request), you find that Obama’s numbers improve substantially. As the table illustrates, inflation-adjusted non-interest spending has grown by only 0.2 percent per year. Those are remarkably good numbers, due in large part to the fact that government spending actually fell in nominal terms last year and is expected to shrink again this year. We haven’t seen two consecutive years of lower spending since the end of the Korean War! Republicans can argue, of course, that the Tea Party deserves credit for recent fiscal progress, much as they can claim that Clinton’s relatively good numbers were the result of the GOP sweep in the 1994 elections. I’ll leave that debate to partisans because I now want to do what I did last year and adjust the numbers for TARP and other bailouts. In other words, how does Obama rank if you adjust for the transitory distorting impact of what happened during the financial crisis? Well, as you can see from this final table, Obama’s 2013 numbers are much better than his 2012 numbers. Instead of being in second-to-last place, he’s now in the middle of the pack. I used a slightly different methodology this year to measure the impact of TARP and related items, so all of the numbers have changed a bit, but Reagan is still the champ and everyone else is the same order other than Obama. As I constantly remind people, good fiscal policy occurs when the burden of government spending is falling as a share of economic output. And this happens when policy makers follow my Golden Rule and restrain spending so that it grows slower than the private economy. That’s actually been happening for the past couple of years. Even after you adjust for the quirks of how TARP repayments get measured. I’m normally a pessimist, but if advocates of small government can maintain the pressure and get some concessions during the upcoming fights over spending levels for the new fiscal year and/or the debt limit, we may even see progress next year and the year after that. And if we eventually get a new crop of policymakers who are willing to enact genuine entitlement reform, the United States may avoid the future Greek-style fiscal crisis that is predicted by the BIS, OECD, and IMF. That would almost be as good as a national championship for the Georgia Bulldogs! Well, here’s where things get messy, particularly since we don’t have a lot of details. There are basically three options for dealing with financial sector insolvency. In a free market, it’s easy to understand what happens when a financial institution becomes insolvent. It goes into bankruptcy, wiping out shareholders. The institution is then liquidated and the recovered money is used to partially pay of depositors, bondholders, and other creditors based on the underlying contracts and laws. In a system with government-imposed deposit insurance, taxpayers (or bank consumers via insurance premiums) are on the hook to compensate depositors when the liquidation occurs. This is what is called the “FDIC resolution” approach in the United States. And in a system of cronyism, the government gives taxpayer money directly to the banks, which protects depositors but also bails out the shareholders and bondholders and allows the institutions to continue operating. As far as I can determine, Cyprus wants to pick the third option, sort of akin to the corrupt TARP regime in the United States. But that approach can only work if the government has the ability to come up with the cash when banks go under. I’m assuming, based on less-than-thorough news reports, that this is the real issue for Cyprus. It needs taxpayers elsewhere to pick up the tab so it can bail out not only depositors, but also to keep zombie banks operating and thus give some degree of aid to shareholders and bondholders as well. But other taxpayers don’t want to give Cyprus a blank check, so they’re insisting that depositors have to take a haircut. In other words, the traditional government-imposed deposit insurance regime is being modified in an ad hoc fashion. And this is why events in tiny Cyprus are echoing all over Europe. Folks in other nations with dodgy banks and unsound finances are realizing that their bank accounts might be vulnerable to haircuts as well. I definitely think the insolvent institution should be liquidated. The big-money people should suffer when they mismanage a bank. Shareholders should lose all their money. Then bondholders should lose their money. Then, if a bailout is necessary, it should go only to depositors (though I’m not against the concept of giving them a “haircut” to save money for taxpayers). But Cyprus apparently can’t afford even that option. And the same is probably true of other European nations. In other words, there isn’t a good solution. The only potential silver lining to this dark cloud is that people are sobering up and acknowledging that the problem is widespread. Whether that recognition leads to good policies to address the long-run imbalances – such as reductions in the burden of government spending and the implementation of pro-market reforms – remains to be seen. Governor Romney’s campaign is catching some flak because a top aide implied that many of the candidate’s positions have been insincere and that Romney will erase those views (like an Etch-a-Sketch) and return to his statist roots as the general election begins. I’m surprised that anyone’s surprised. Hasn’t anybody been paying attention to his comments and track record on issues such as the value-added tax, healthcare, Social Security reform, budget savings, ethanol subsidies, Keynesian economics, and the minimum wage? In any event, people should be more agitated by his recent defense of the corrupt TARP bailouts. Here are the key sections of a report from NBC Politics. 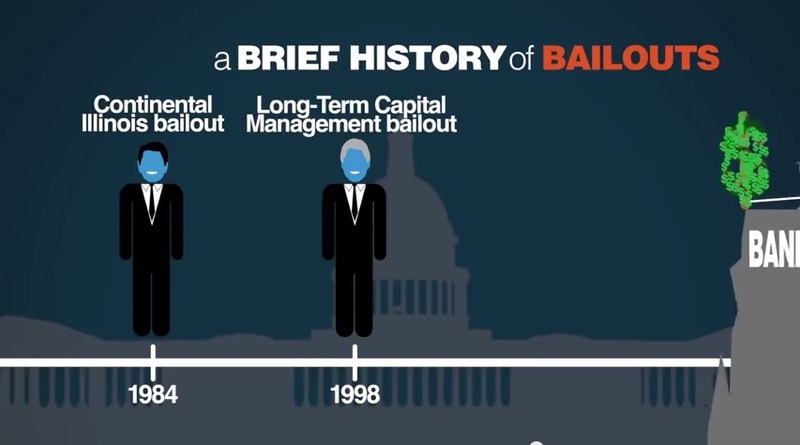 I can understand how some politicians got panicked back in 2008 by some of the reckless and inflammatory rhetoric that Bush, Paulson, and others used to build support for their bailout plan. But it’s now become more and more obvious that there was a much better alternative (as I explained in this post giving Cheney a kick in the pants), involving a process known as FDIC resolution. That approach would have recapitalized the banking system without the corruption, favoritism, and moral hazard that characterized the TARP bailout. "Which one of us is Tweedledee?" I don’t know whether Romney doesn’t understand this, hasn’t bothered to learn about the issue, or simply thinks it is good politics to be pro-bailout, but it doesn’t matter. There is no good explanation for his actions. This is going to be a miserable and depressing election season, revolving around whether the nation should replace a statist who calls himself a Democrat with a statist who calls himself a Republican.